In April 2012, Facebook acquired the hugely popular photo sharing based social network Instagram for around 1 billion dollars in cash and stock. The result of this acquisition didn’t bring much to the masses, until now. In an event in Menlo Park today, Facebook announced the launch of Video on Instagram, which as the CEO of Instagram Kevin Systrom puts it,“…is the same Instagram we all know and love, but it moves.”. Here’s everything you need to know about Instagram’s newest service. Earlier in the year, Twitter launched a new service called Vine. Vine videos are to video, what tweets are to text. Short and sweet is the name of the game here. Vine allows users to post videos to Twitter and Facebook with a maximum length of 6 seconds. While that might not seem like much, it has caught on really well and is being used both by users as well as companies. It’s proving to be surprisingly effective in marketing as well. 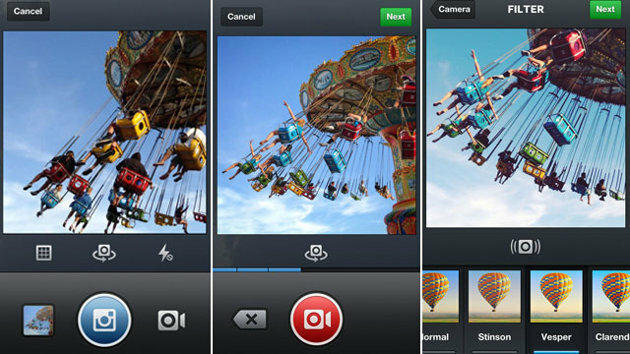 Now, Video on Instagram is very similar to Vine, save for a few key differences. It lets you capture short videos, but the maximum duration is almost double that of Vine at 15 seconds with a 3 second minimum and it even allows multiple cuts. Perfectionists will be happy to know that they can even delete the last cut or segment of the video as well as select a preview image. True to their roots, Instagram is also including 13 exclusive video filters for this service, which is already available right now. It will be integrated into the Instagram apps on Android and iOS and naturally. iOS users however get an extra new feature called Cinema stabilization that nullifies the shakiness in a captured video. For now it’s an exclusive feature, but could make its way to Android as well. Since everything is integrated into the same Instagram app, Facebook sharing is quick and easy as well. Perhaps the best part about this is, once the inevitable spam of Videos from Instagram turns up on your Facebook feed, you won’t have to keep watching the same looping video, it plays just once and then stops. So basically it’s short video with filters, which might not sound interesting, but will inevitably turn out to be popular. Your thoughts on the new Video on Instagram feature?